Call before you haul to be sure this park is open. 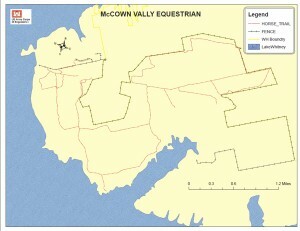 McCowan Valley Equestrain Center/Trails is owned and maintained by the US Army Corps of Engineers. Directions: From the City of Whitney, Texas, go north on FM 933 to FM 1713. Turn left on FM 1713. Continue on FM 1713 until the road forks. Stay left at the fork, this road becomes Spur 1713. FM 1713 dead ends into the park. There are two gated entrances, normally the gate house on the right is open for all park visitors. Contact: Tel. (254-622-3332), Always be sure to call before arriving, especially if you wish to stay overnight as reservations for overnight camping may be required. Park Hours: The park gate house is open and manned from 6am – 10pm, from 10pm – 5:59am the gates are closed. 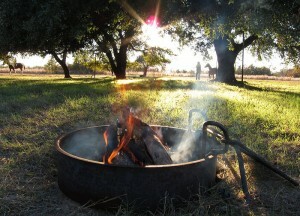 Cost: $1 per person for day riding and $20 a night for equestrian camping. Mileage: Exact mileage is unknown at this time. 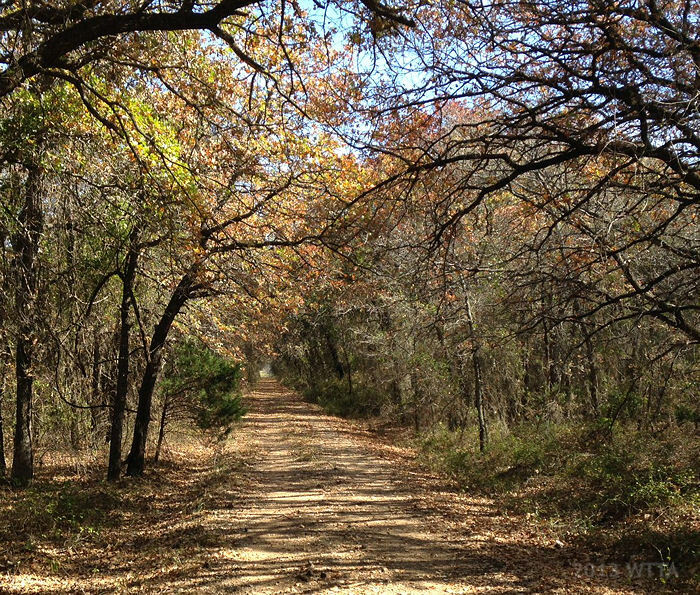 The park consists of approximately 3,000 acres on the eastern shore of Lake Whitney. 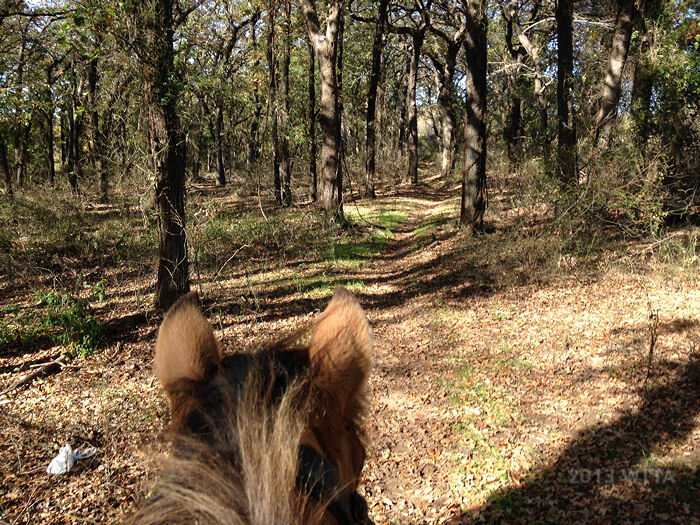 Terrain: McCown Valley is a wonderful place to ride, shoes or boots for your horse are not a necessity due to the soft footing. The sand is fairly deep in some areas giving your horse a real work out. Horses not used to the deep sand may fatigue so be mindful not to over do it. Avoid riding off trail along the shore line and beware of possible mud bogs, especially if the lake waters are low. Some trails are heavily wooded with lots of shade and other trails are in the open. Trails are mostly flat, with the exception of one small area. Several trails are wide and will accommodate wagons/carts. Facilities: McCown has three areas in the park just for equestrians! 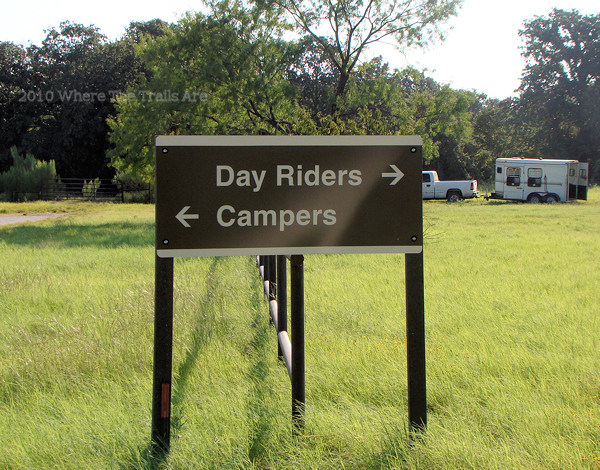 They are the day use area, TETRA group campsite, and the 29 site equestrian campground. Day Use & TETRA Group Campsite –The day use and the group campsite are located next to each other but divided by a pipe railing. 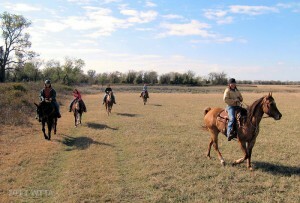 The group campsite was put in by TETRA (Texas Equestrian Trail Riders Association), a strong resource for trail development and improvement in Texas. The overnight group camping area has 10 covered stalls provided by TETRA (Texas Equestrian Trail Riders Association) and 10 electrical hookups with water. Running water is located in both the day use and overnight group campsite and there are portable restrooms. The parking area is large with plenty of room to maneuver your truck and trailer. Gate access to the trails is located on the southwest side of the day use area. 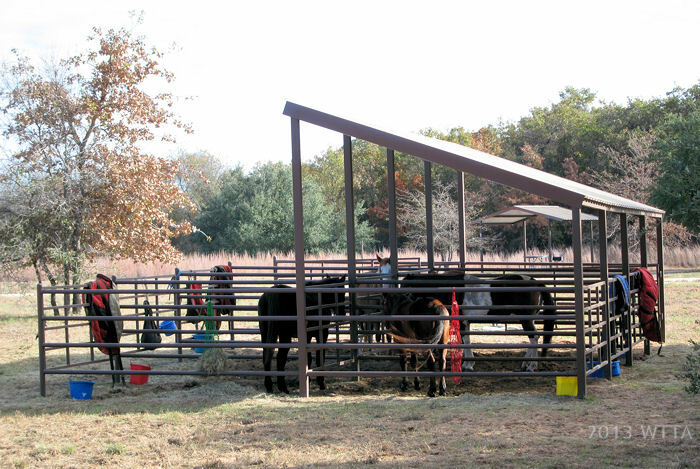 Horse pens at the Equestrian Campsite. 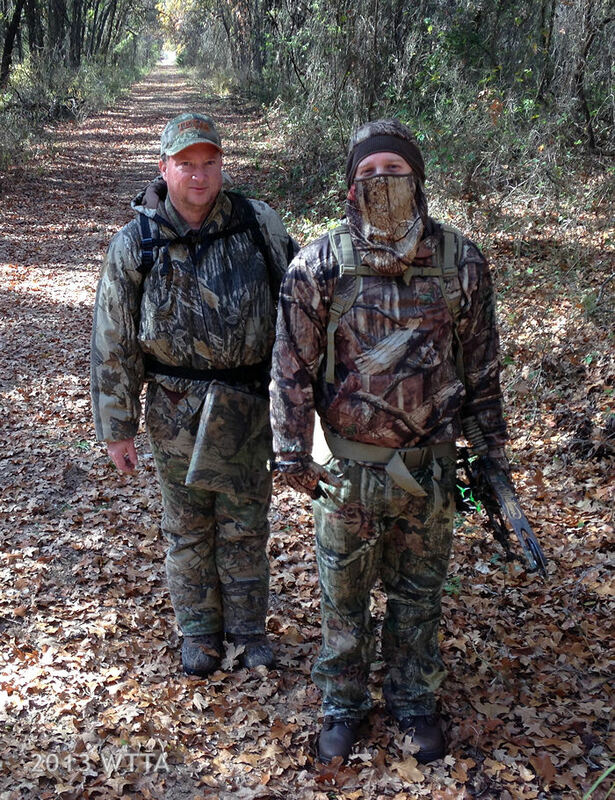 Friendly bow hunters in their camo at McCown. Nov. 2013. 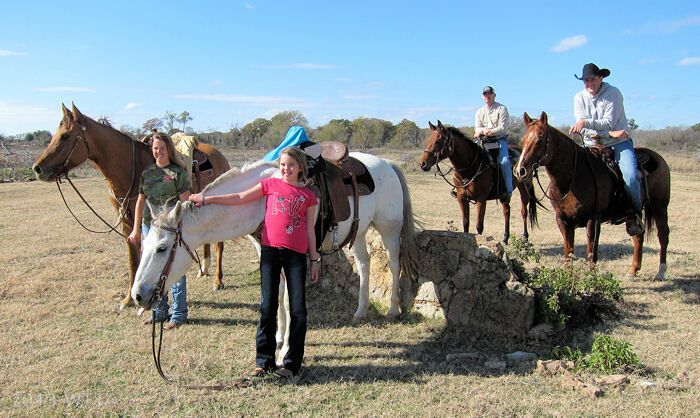 29 Site Equestrian Campground – The facilities at the 29-site gated equestrian campground are nice. You need a code (get this from the attendant in the gatehouse) to enter this gated facility. This site is separate from the group campsite and day use trailhead. When entering the front coded access gate of the equestrian campsite, immediately look to your left, you will see a path that leads to a the trails. 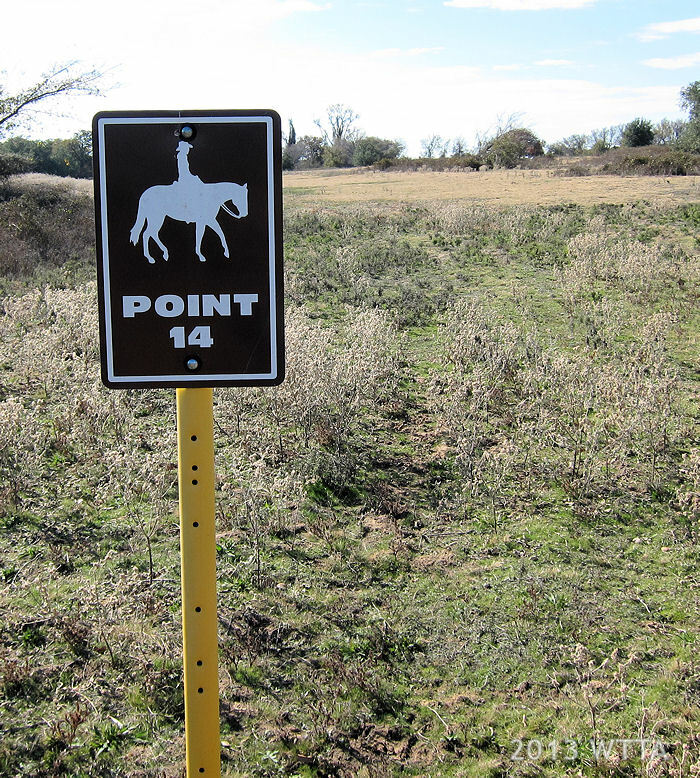 This is on the southwest area of the equestrian campsite (note the map makes look like the trail access in this area is on the southeast area of this campsite further away from the entrance gate, but that is not correct.) When entering this campground on your right side you will find campsites nestled under trees while in the center and to your left the sites are in the open grassy areas. Each site has water and electricity (50 and 30amp), picnic table, fire ring, barbecue grill, lantern hangers, and two tie posts. Picnic tables in the open areas are covered and on concrete slabs while the picnic tables in the shady forest nooks are not. Pens are available on a first come, first serve basis and are located on the west and east ends of the campground. The pens are identical on both sides and consist of four large side by side pipe pens which can be sectioned off to form eight smaller pens, providing a total of 16 small pens for the entire campsite. Half of the pens are covered. At the center of the campground is a restroom facility with flushing toilets, hot and cold running water, showers, and a handy hitching post. The only downside to the campground is a very heavy preponderance of grass burrs. It seems that within the park, the equestrian campground is the worst and thickest area of grass burrs. The burrs were unavoidable and easily stuck everywhere; in lead ropes, pants legs, on the horses, on our poor dog, on tack, in the trailer, and in my skin – ouch! Hopefully this situation will improve, but I’d recommend a campsite under the trees and not out in the open grassy areas. Hunting: Please note hunting is allowed at this park so keep in mind when hunting season is open while planning your ride. Pets: Allowed but must be on leash. 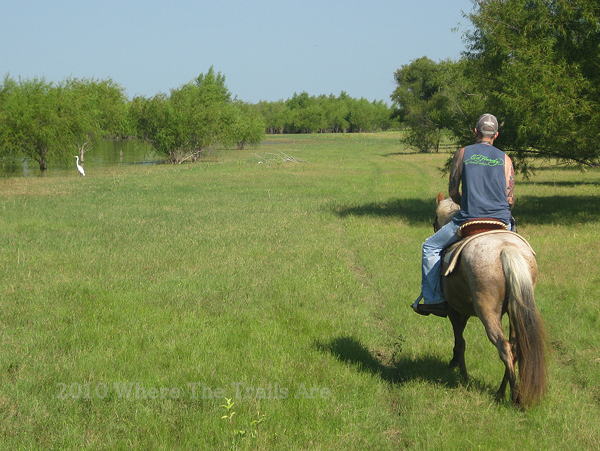 Trail Users: Park use is shared by equestrians, hikers, cyclists, hunters, wildlife, and cattle. ATV and motorized vehicles are not allowed. 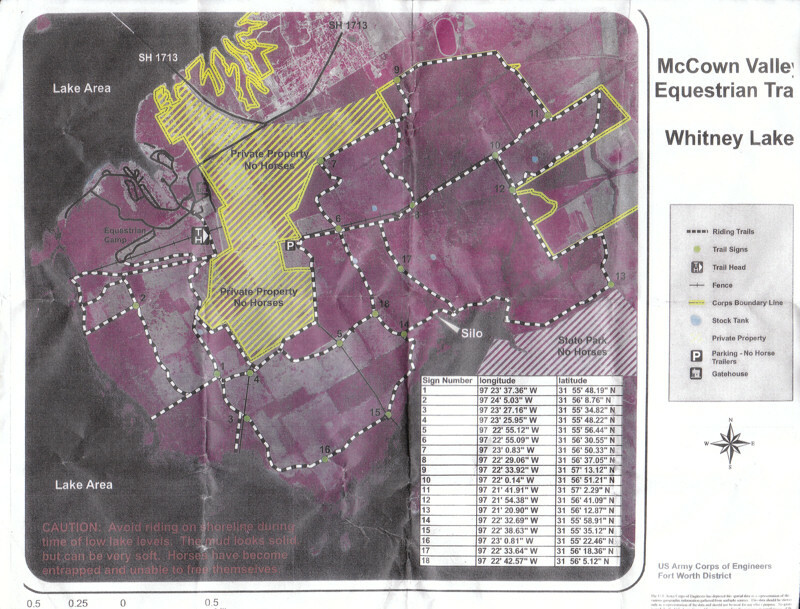 Map: When arriving to the McCown Valley Equestrian Area you will pay your fees and can ask for a map at the gate house. If you are going to the equestrian campsite be sure to get the gate entrance code as well. You might find the map above (from the US Army Corps of Engineers) helpful for review before leaving home. The map above is not the same map provided at the park, however, you can click on this map to enlarge it. The purple map, below, is provided at the park gatehouse when requested. The map below has a caution statement “Avoid riding on shoreline during time of low lake levels. The mud looks solid but can be very soft. Horses have become entrapped and unable to free themselves”. Trail Markers: The trails are not marked well but there are 18 number signs which correspond with the numbers on the park map. I found these points to be very helpful in navigating my way through the park. Also be sure to take notice of the warning signs. 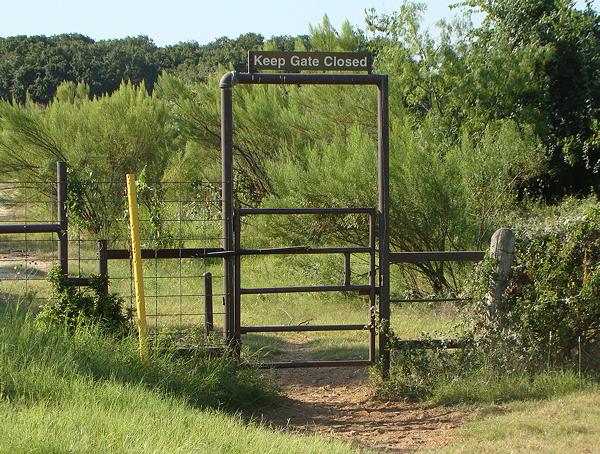 Cattle: The park is gated as there are cattle roaming the ranch. Caution is advised when passing through the gates as they are self closing by way of a spring. If you let go of the gate it will close due to tension on the spring and will hit you and/or your horse if you have not cleared it. Coggins: Each of the few times I’ve visited this park I’ve not been asked to show my Coggins at the entrance gate. However, please keep your Coggins on you while ridding in the park, as a park ranger may request to review it. 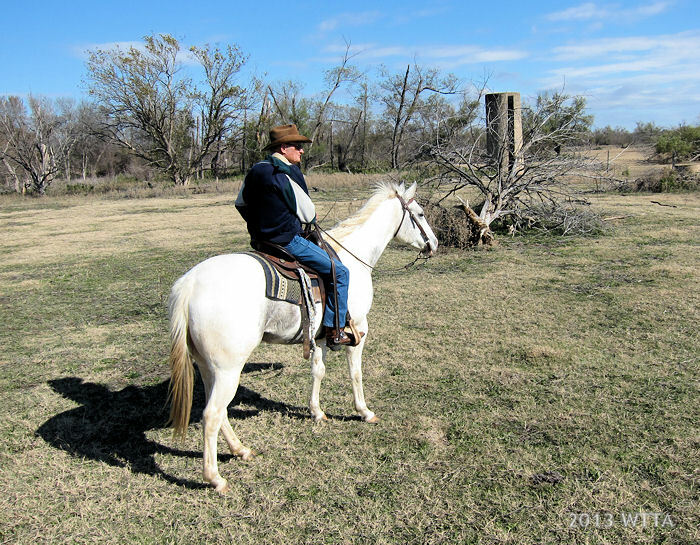 Wayne and his light colored paint enjoying the trails at McCown, taken at the silo. Nov. 2013. Nov. 2013 Review: McCown Valley Park off the shores of Lake Whitney in North Central Texas near Waco is managed by the US Army Corps of Engineers and consists of approximately 3,000 acres of fine trail riding. We spent the long Thanksgiving weekend at the Equestrian Campground. The ground is a sandy surface which is deep in spots with very few rocky areas; most horses will not require boots or shoes. The trails weave through thick forests and follow along the outer boundaries of open meadow-like pastures. The terrain is level throughout the entire park with the exception of one small area. Two trails running parallel to each other nearest the equestrian campground on the west side offer a break from the flat terrain. One of the trails is at a higher elevation and the other trail lies in a low wide ravine with many smaller spurs branching off, going up and out of the ravine and then back down into it again. You can chose to go straight down the ravine and gradually ride out up a hardly noticeable slope, or weave in and out of the ravine riding between the two parallel trails, which is lots of fun by the way. Over Thanksgiving weekend I rode 13 miles of trail mostly on the west side of the park and 10 miles of trail the following day mostly on the east central section of the park. During this visit I saw most of the park, missing only a small portion of trails. Although the trails are not marked at close intervals, there are 18 points identified by numbered signs. Each point is also located on the map with longitude and latitude coordinates. I did not use the coordinates but I was able to navigate fairly well by referring to the map as I came to a sign. I found two water sources on trail — large puddles of water and a stock tank. 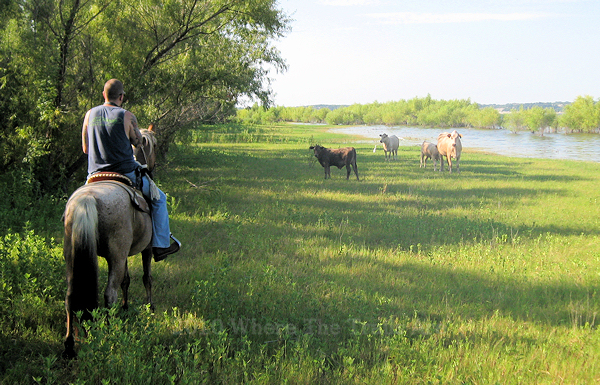 Do not ride your horse into the lake or close to the shoreline at McCown Valley. 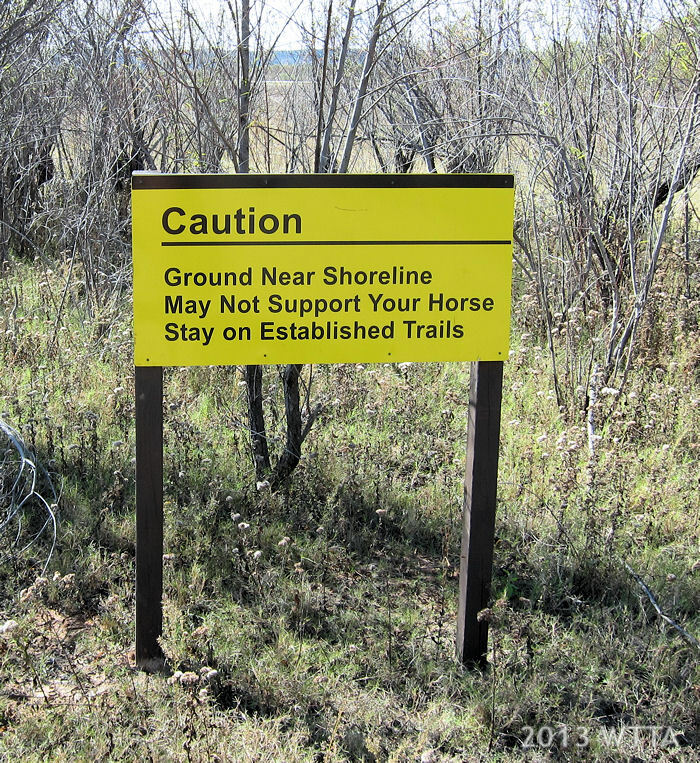 Warning signs are posted in the park and on the map giving caution not to ride into the lake or close to the shoreline as the ground is unstable and may not support your horse. I’d advise staying clear of the lake beach. There is a two-track road that runs along the lake’s shore but is well enough away from the beach to be safe. You can see the two tracks and it looks as if a vehicle, maybe a park ranger truck, has driven down this path. This is a nice long flat path with good footing and a decent view of the lake. It is a great trail for a gallop. Park use is shared by equestrians, hikers, cyclists, hunters, wildlife, and cattle. ATV and motorized vehicles are not allowed. I saw several bow hunters tracking deer. 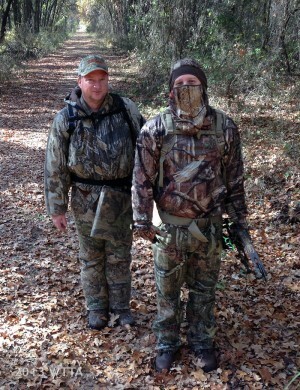 The hunters were friendly and allowed me to snap a picture of them. I also ran across other friendly riders enjoying the long Thanksgiving weekend. Aug. 2010 Review: While visiting with my brother, who lives near the park in August of 2010, we planned a ride together. This was our first time to ride the trails at McCown Valley. The lake water level was normal if not high and the ground was not boggy. The park appeared lush with lots of grass and vegetation. 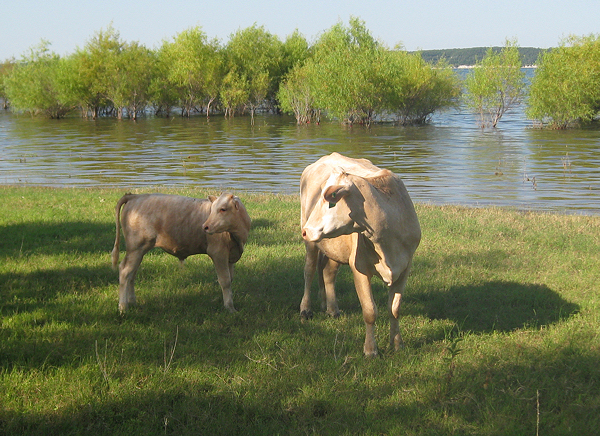 Plump cattle were seen cooling off and grassing on the shoreline. 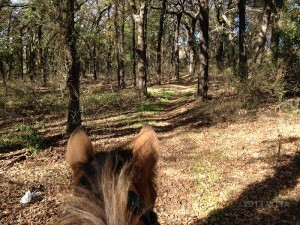 Some trails wind through dense forests giving us a welcomed break from the Texas summer sun. Open pastures with great footing allowed opportunities to really move out if so inclined. Most of the land is flat with no hills, inclines, or gullies. McCown Valley is a wonderful place to ride, shoes or boots for your horse are not a necessity due to the soft footing. The sand is fairly deep in some areas giving your horse a real work out. 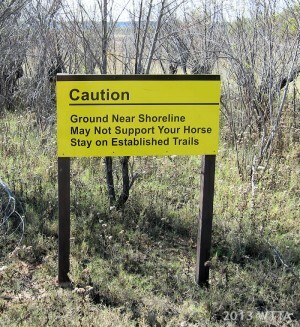 Horses not used to the deep sand may fatigue so be mindful not to over do it. We explored the west side of the park. Once entering the park we headed right going west down the fence line. This route took us to the west corner of McCown Valley where the shoreline met the fence. We followed the trail north for a while and then weaved east through dense woods leading into a wide open green pasture and then back south through the trees returning to the lake. We made a big loop and found the fence line again taking us back to the trail head. I was wishing for more time and less heat. According to my GPS we traveled only 5 miles on just a quarter of the park acreage all on the west side. If you have information on this park or would like to share a trail tale please feel free to submit it my way and I’ll get it up on the site. Gate to the trails at the day use and TETRA group campsite. Lake levels were high in Aug. 2010. 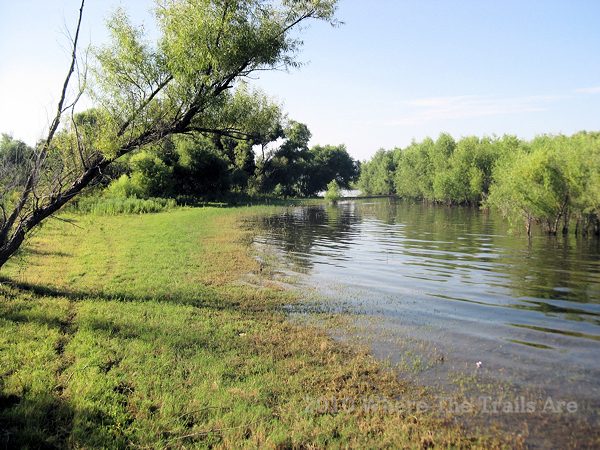 Aug. 2010, high lake levels.